Weddings in China are quite elaborate. In the photo, taken at the Temple of Heaven overlooking the city of Beijing, China, a couple stands at the bottom of the pagoda steps for a portrait. 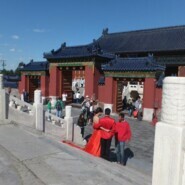 Traditionally the Chinese wear red for weddings. White is for mourning. The trend in China now is to mix the red with the white, copying western traditions and in reversal the westerners are beginning to use colored wedding dresses. The wedding itself is a civil ceremony, a visit to an office for the paper forms. The reception is an expensive elaborate affair, paid for by the groom’s family who also must provide a home for the newly married couple. With the one child rule, most families begin saving for their son’s wedding and home when he is born. Chinese girls will not marry a man who does not have a home, a job and come from a good family. Chinese men also marry girls from good families. The family is very important. I spoke with a college professor who indicated that he was glad he had a daughter because he would not have to save for her wedding and home. Chinese parents usually prefer a son. Wedding portraits are taken at monuments and outdoor settings. The couples pose dramatically. Often while I spent the month in China, I heard fireworks which at first sounded like gunfire. There are no regulations for fireworks and the Chinese explode them for weddings, funerals and other celebrations. When a newly married couple drove away from my hotel after celebrating a reception, men of the wedding party were stationed along the circular drive of the hotel and as the couple drove away, the grounds exploded with loud bangs and blue smoke. Everyone laughed and loved the noise.